Some 23 years after the first Diamond Anniversary Editions (DAE) release entitled Old Times They Are Not Forgotten, the same team has joined forces with a current label for some very special releases. All recordings on the DAE label were never released before in any form. Due to the many copies (counterfeits of the original) that were made from the original DAE releases it did not make much sense to do another run of the first CD pressings at the time. This is maybe a good opportunity to state that DAE themselves never did a reissue of any kind. At the time there was just the original run, and a reprint was never made. Most copies that appear from time to time on the market are therefore not the original DAE issues and have nothing to do with the label. Back in the ’90s vinyl was out of fashion and compact discs were the new thing. Therefore, the request for CDs was so much higher and after locating the shows they were only released on CD. Now, with the revival of vinyl, DAE has decided to give the shows a well deserved re-release on LP. The first title chosen is actually the 5th CD release, Here I Go Again, containing the August 24th 1969 midnight show. Back then the tape was wrongly dated and it was released as being the August 23rd dinner show. This new release is completely updated and remastered and for the biggest part sourced from multitrack sources, plus the original tape used for the CD release. We realise our friends from Gravel Road Music have also reissued the show with a little bit of help from the original DAE tapes, but they left out some tracks from the original show, which were replaced by other versions. And the so-called ‘raw material’ did not add much up to the package as we’d hoped. Even the original CD release sounds way better! We believe this new, updated double album is the best outing of this show till now! And of course, the show is included on CD, too. 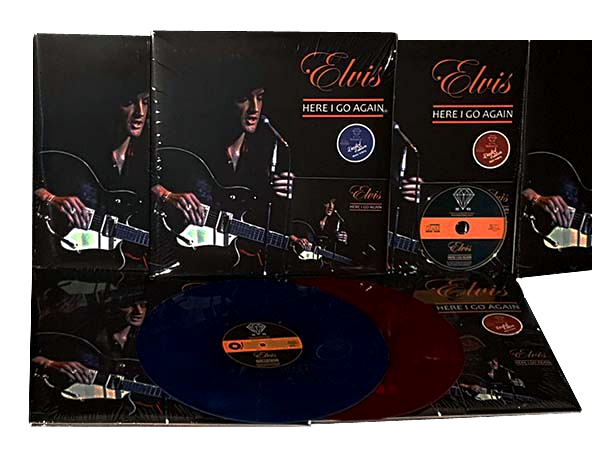 Opening Theme / Blue Suede Shoes / I Got A Woman / All Shook Up / Monologue / Love Me Tender / Jailhouse Rock – Don’t Be Cruel / Heartbreak Hotel / Monologue / Hound Dog / I Can’t Stop Loving You / Johnny B. Goode / Monologue (Life Story) / Baby, What’d You Want Me To Do Runaway / Are You Lonesome Tonight? Words / Yesterday – Hey Jude / Introductions / In The Ghetto / Suspicious Minds / What’d I Say / Can’t Help Falling In Love. This entry was posted on Monday, April 16th, 2018 at 11:25 am	and is filed under Import CDs. You can follow any responses to this entry through the RSS 2.0 feed.